Kids these days get to have so much fun, there are so many places around to entertain them and to have fun. Even though we love getting out and about in the fresh air on our days out, I am also aware that the kids like to do something different. 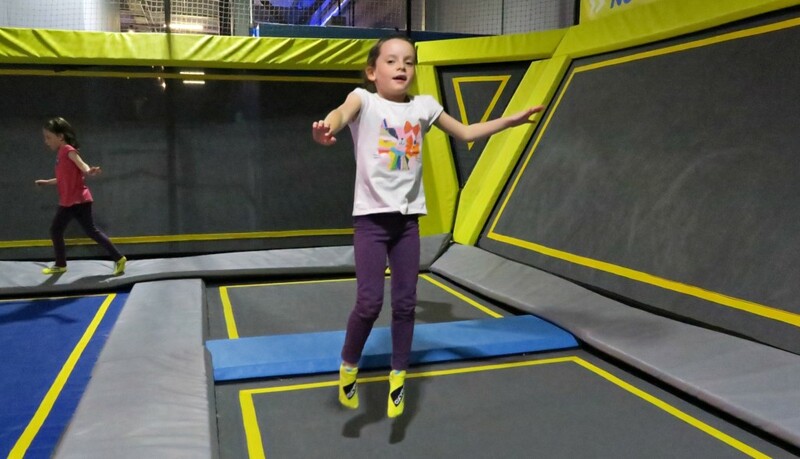 So when we were given the opportunity to go and review Oxygen Freejumping Park in Southampton, I knew my kids would ‘jump’ at the chance! 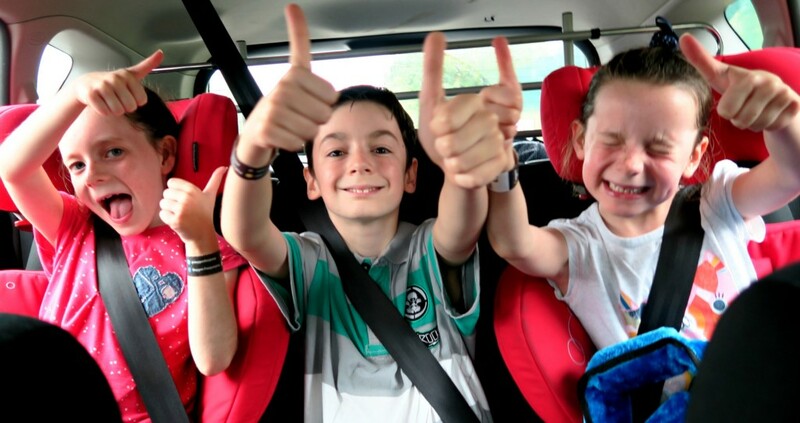 Lots of their friends have already been and have been raving about it, so they were so happy to go. It’s only 10 minutes drive from us, and very easy to find. With lots of free parking, although this is shared with some other larger shops so I do recommend you get their about 30 minutes before your time slot. There are lots of stairs to climb to get to the entrance right at the top, a nice warm up before trampolining! Although they do have a lift if you need it. 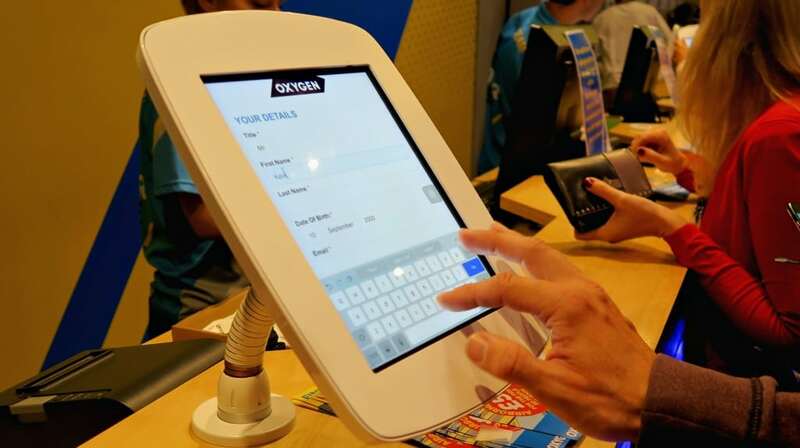 Once you arrive at the top, you need check in, you can book online and pay for everything first, so that makes it much easier when you arrive. You do need to purchase the Oxygen trainer socks, but those are yours to keep for next time you visit, so only a one off price. If it is your first time you also need to fill in a wavier form, this is to let them know of any medical conditions, medicines you’re taking and that you agree to their conditions. Which are the rules of the park and to understand that trampolining isn’t a completely risk free activity! Oxygen have thought about things like lockers for your items, they are provided lots of lockers for you to put all your items in. Punch in a code to lock/unlock the locker, but just remember to look at what locker number you put your stuff in! I didn’t, but luckily I had recorded for the vlog! 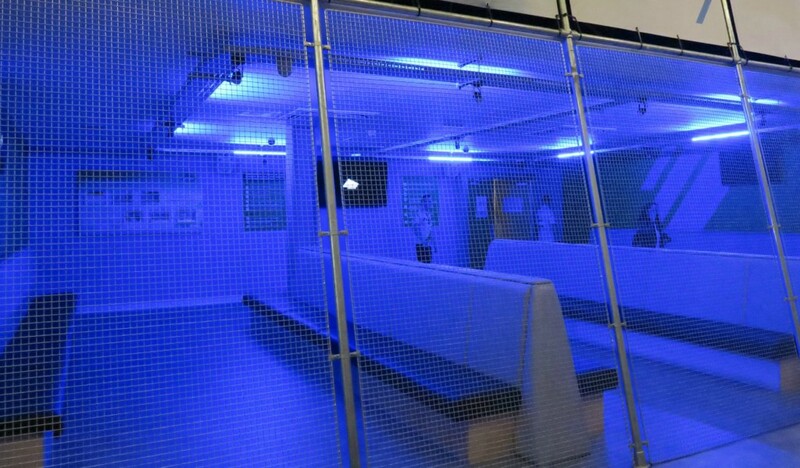 Once this is all done and your socks are on, you enter a room where you need to watch a safety video and hope the kids are paying attention. Once they have watch this you enter the trampoline room, watch out, as much as the staff say for everyone to walk, they don’t, they run like a herd of elephants. We nearly got flattened when we were leaving at the end of the session, when the new session came in! Oxygen is split up into areas, first off is the giant air bag, this was a bit much for my kids start with so they headed to the freejumping area. 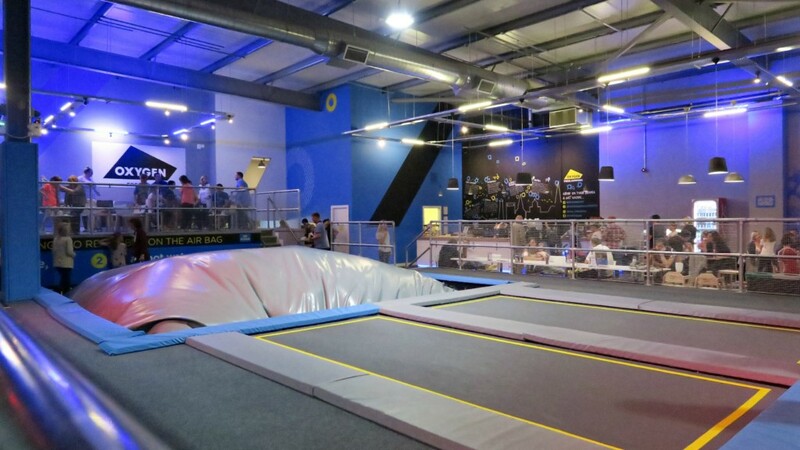 The floor and walls are covered in trampolines, so they could bounce as much as they liked. At the side of this you have 2 smaller jumping areas, one for under 8’s and another for dodgeball, my kids stayed out of this one as they were being quite rough and mine don’t do rough! The foam pit obstacle course was out of action, it didn’t have any foam in it so they weren’t able to do this one. Which was a shame as it looked really fun. Alongside this was a free running course, where you could jump from post to post ect. 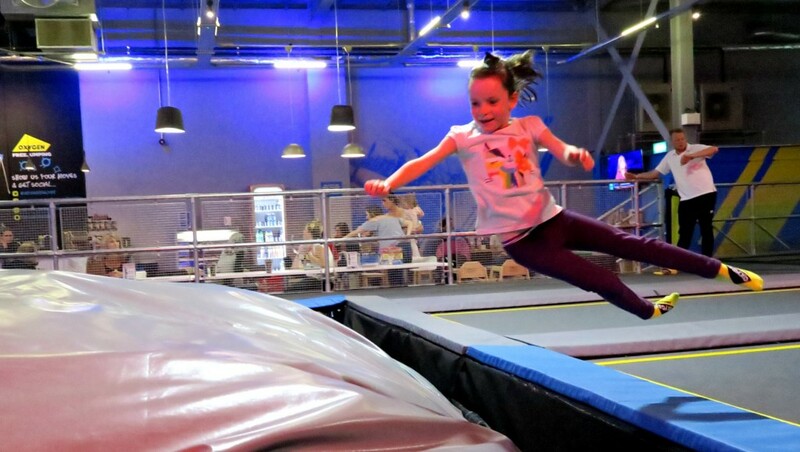 Once they gained their confidence they wanted to have a go at the giant airbag, with a trampoline to run on and a giant airbag to fly into, it was a big hit! Even Daddy had a go at this one, with a giant belly flop! And I caught it on film. Each session runs for an hour, and this was probably ok timing. The kids were getting hot and tired by this point, but they would have loved to stay longer! 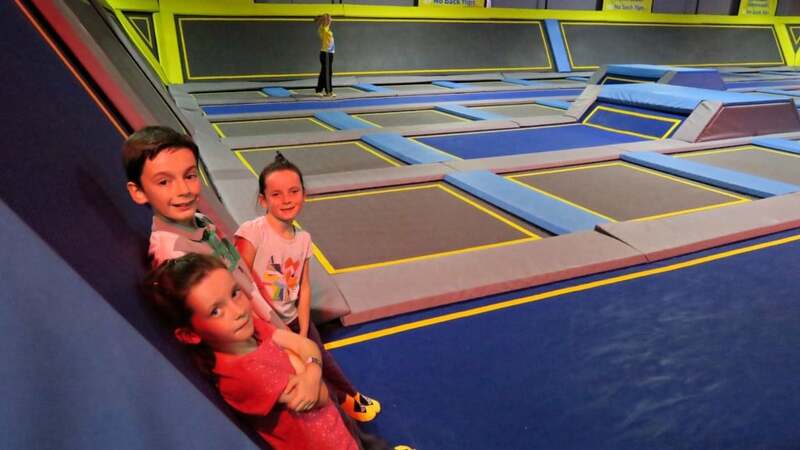 Each freejumping session costs £10 per child for an hour, they have a cafe for you to wait in if you want or you are welcome to walk around with your child too. 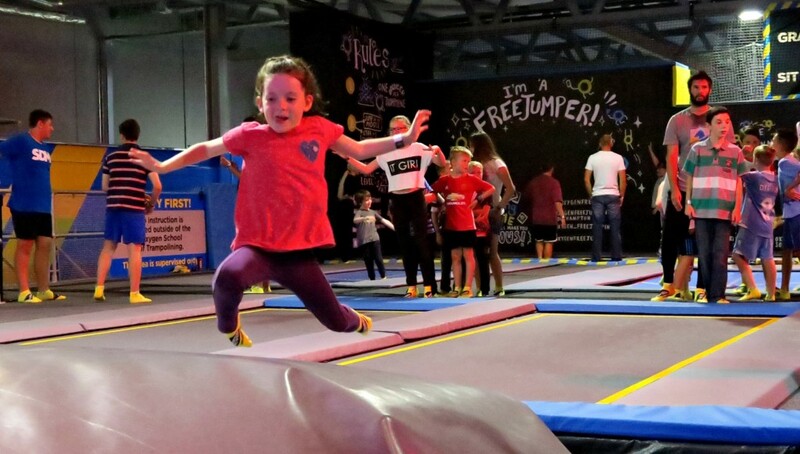 Oxygen Freejumping also have plenty of other activities going on too, from parties, pre-school age sessions, Trampolining School and fitness classes. The fitness classes sound good, as I can imagine it works you quite hard! I have put together a little video for you to see what we got up to. 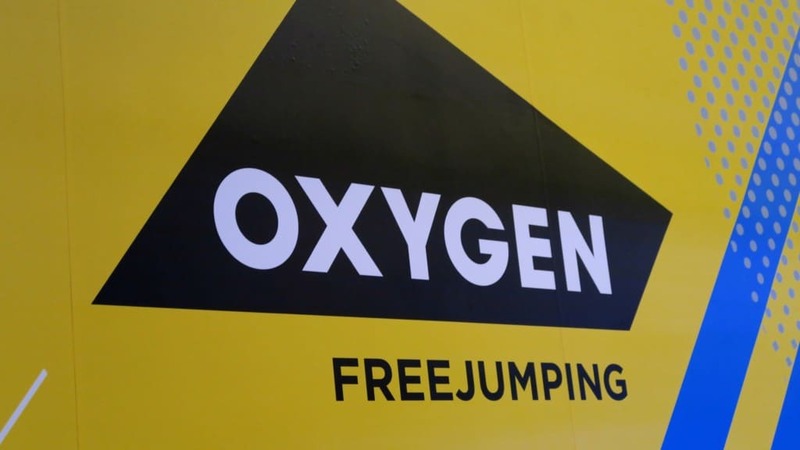 Oxygen Freejumping went down very well with my kids, and us as parents too. I would recommend you go along, as it is a childs dream! *We were given complimentary sessions but all opinions and words are of my own. 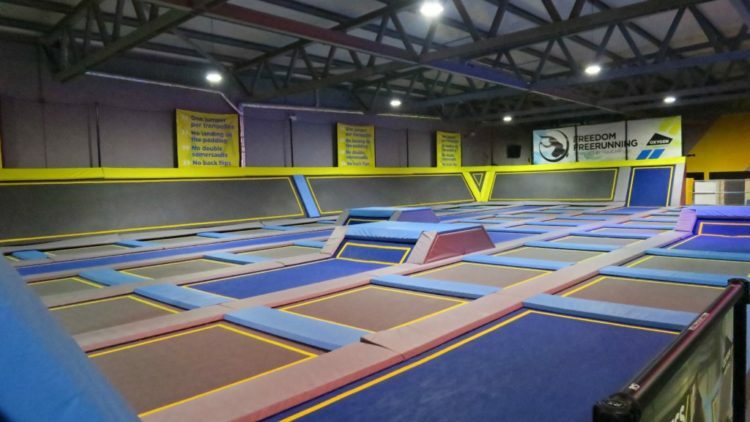 We have a couple of these trampoline parks in Manchester, and I can’t wait to go and have a jump around. 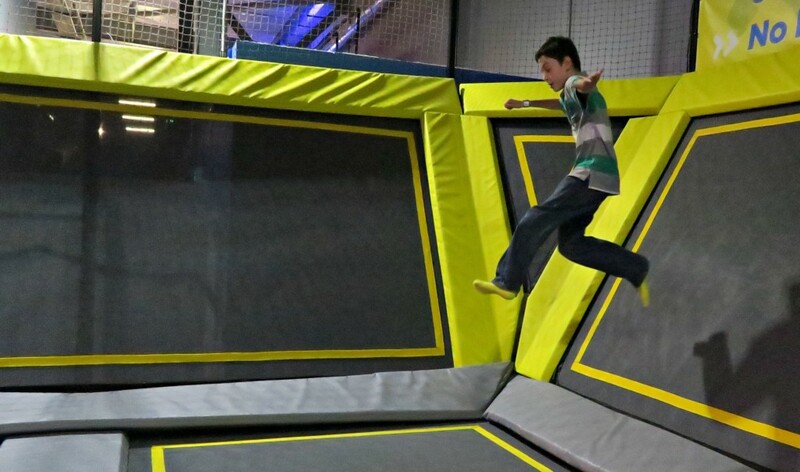 This looks loads of fun I think we have something similar not far from us called bounce but my sons a bit too young for it yet. I’ve always fancied a go at one of these places but our nearest one is a little too far to travel…. There seems to be more popping up over the country so fingers crossed one comes your way soon!